In the late 1800s, Peruvian fishermen first noted decreased harvests around Christmas. Every few years, an influx of warm water in the Pacific Ocean would decrease the amount of upwelling nutrients, thus driving away the fish. The fisherman named the phenomenon "El Niño" for the Christ Child. Ever since, scientists have been studying El Niño and the later-named La Niña, but only now have they reached a consensus on defining the climatic events. The National Oceanic and Atmospheric Administration (NOAA) announced on Sept. 30 that experts in the federal government and academia have developed an operational index and definitions for El Niño and La Niña, which are extremes of the El Niño/Southern Oscillation (ENSO) cycle. "Before now, no widely accepted operational definition of El Niño or La Niña existed," said retired Navy Vice Admiral Conrad Lautenbacher, undersecretary of commerce for oceans and atmosphere and NOAA administrator, in a press release. This effort, he said, will ease the communication among scientists who monitor and study the ENSO cycle and create more uniformity in the message to the public. El Niño and La Niña are newly defined as warming or cooling, respectively, phenomena occurring in a particular region of the equatorial Pacific Ocean over a three-month period. Climate variability is often measured by comparing the observed conditions to the long-term mean conditions. Graphic courtesy of NOAA's Climate Prediction Center. While announcing that reaching a consensus on the definition of these extremes might seem overtly positive, Scott Curtis cautions that releasing the definition to the public may tend to make the impression that there is only one way to measure and monitor El Niño and La Niña. Curtis is a professor at East Carolina University and has been researching ENSO for many years. Although he agrees that the new definitions and indices are good, he and other scientists have also published other ENSO indices and definitions. NOAA defines the new ENSO index as three-month averages of sea surface temperature departures from normal for Niño 3.4, a critical region in the equatorial Pacific. Here sits the so-called "equatorial cold tongue," a band of cool water that extends along the equator from the coast of South America to the central Pacific Ocean. Changes in average sea-surface temperatures are critical to determining major shifts in the pattern of tropic rainfall, which influence jet streams and patterns of temperature and precipitation around the world. While the Niño 3.4 index focuses primarily on sea-surface temperatures, Curtis, with colleague Bob Adler (a climate researcher with NASA-Goddard Space Flight Center), developed an index based on satellite-derived precipitation. Klaus Wolter, a researcher with the Cooperative Institute for Research in Environmental Studies at the University of Colorado, published another index which fuses sea-surface temperature, sea-level pressure, wind and other data. "These alternate indices have intrinsic value because they tell us the state of the climate of the Pacific," Curtis says. Also, some regions can become dry or wet before a warming is realized at the surface of the ocean, he adds. 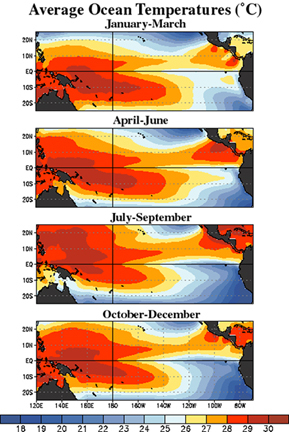 Additionally, a hazard exists that the sea surface warming levels are different from one El Niño or La Niña to the next, and one region of the equatorial Pacific may become warm before another region, as shown in indices published by Kevin Trenberth, head of the Climate Analysis Section at the National Center for Atmospheric Research. Though heavily involved in the most recent definition effort, Trenberth worries that weather predictors might be led astray by transient short-term variations in sea temperatures that may indicate an El Niño or La Niña where a longer perspective after the fact suggests a false alarm (as happened earlier in 2003). "If we are concerned about the global reach of ENSO, its "teleconnections," and want to better predict its onset, we as a scientific community should be aware of the entire climate system, and thus look at several indices in parallel," Curtis says. Nevertheless, NOAA's new Niño 3.4 is now the primary index for assessing the state of the ENSO cycle, as determined by experts at the Scripps Institution of Oceanography, the Center for Ocean-Land-Atmosphere Studies, the Center for Ocean-Atmospheric Prediction Studies, the International Research Institute for Climate Prediction, the National Center for Atmospheric Research, the University of Washington, and NOAA. "It probably makes sense to have an official definition of El Niño and La Niña to keep the public from getting confused," Adler says. "Without it you have different people saying different things, even within the same agency." So based on the new index, NOAA has developed operational definitions for El Niño and La Niña. These new definitions are appropriate for the classic definitions of the climatic twins, Curtis adds. Trenberth first proposed a standardized definition of El Niño in 1997. He agrees that the new definitions will help communication between scientists and the public, but adds that he hopes that scientists will continue working on the indices to eventually adopt one that includes warming indicators other than just sea-surface temperatures. NOAA began using the index and definitions for monitoring and predicting El Niño and La Niña conditions on Sept. 1.